In response to today’s changing work styles, enterprises have deployed a variety of tools such as telephony, email, web conferencing, audio conferencing, video conferencing, presence and instant messaging to facilitate faster information sharing and streamlined decision making. Although attempting to address the need to expedite communication and foster collaboration, few of these solutions are linked together and as a result cause usability issues for workers and manageability issues for IT departments that detract from overall company productivity. Enterprises need a solution that allows their employees to collaborate more efficiently while lowering the overall cost of communications. Unified Communications (UC) is a set of communications and collaboration products that provide end users with a single interface and experience across multiple device and media types. Although UC holds great promise for enterprises as one of the few technology initiatives that can lower overall IT costs while adding business value, the UC market encompasses a broad range of products and services. 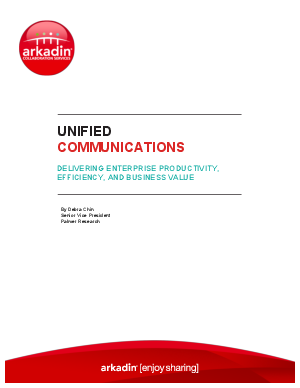 Download this whitepaper to better understand the market trends, how to evaluate one solution vs. another, and the range of deployment options all critical to selecting right UC solution for your organization.